When you want to get around Jordan, you don’t really have a lot of options. You can take a taxi, but there is supposedly little regulation and you could end up in a car with an uninsured driver and an unreliable vehicle. Not to mention that message boards led me to believe that you could get seriously ripped off when taking taxis. You can pay a driver to take where you where you need to go. This gets you in a much nicer vehicle that is definitely insured. And, the driver acts as a sort of tour guide and points out interesting sites along the way. Some even stop for you to take photos when there is a nice panorama other interesting scenery. You can rent a car and drive yourself. I’ve seen many people on the TripAdvisor forums mention doing this on their vacations to Jordan, but I am definitely glad that I did not do this. While most road signs are in English and Arabic, not all of them are in English. 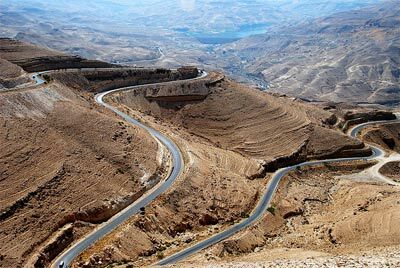 Additionally, driving in Jordan seems to be more of an extreme sport than in the U.S.
You can buy a cheap ticket on the JETT bus, if it services your locations. If you check out the JETT website, then you will notice that these seem to be fairly nice coaches. I can tell you first hand that this was NOT the case for my journey. Keep reading for my JETT bus review. For me, what was most appealing about taking the JETT bus from Aqaba all the way to Amman was the low cost of the ticket. Several buses make the journey each day for a one-way ticket cost of just 7.85 JD. And the journey time is right at four hours. If you do a search on forums like TripAdvisor, then you will read that this is a popular ways of transport for tourists. Sounds good, right? Well, after checking the cost of getting up to Amman by other methods, I determined that I was all about saving that massive amount of cash and taking the bus. I mean, what’s four hours on a coach bus? Not all that bad, right? What I was expecting, was a reasonably nice coach bus with a toilet in the back of the bus. Reality was a somewhat run down coach bus that did not have a toilet on the bus. My gf and I were the only people on the bus who appeared to be tourists, which was also unexpected. Finding out that the bus was air-conditioned was a nice surprise. Online reviews had mentioned that it would be, but they had been wrong about everything else so it was surprising to find it was cool on board. 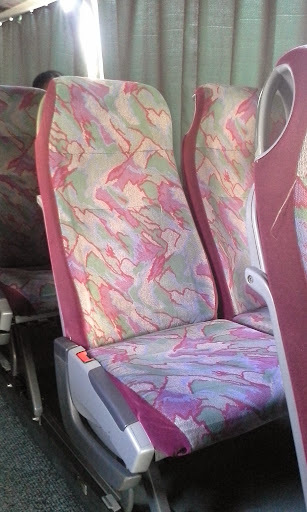 The seats are very narrow in terms of seat width. And there is not a lot of leg room either. I am about 5’8″ and my knees were right up against the seat in front of me. Not a very comfortable journey. I imagine this would be really miserable for a really tall or muscular guy since the seats are so small. The bus has two employees on board – the driver and a co-pilot of sorts. The co-pilot checks your ticket when you board the bus and checks to see if you are bringing any food on-board. Yup, it’s a four-hour journey and they don’t want to you bring on any food. Fortunately, my water and food was hidden in my bag. It was lunchtime and there was no way in hell that I was going to wait four hours to eat! During the ride, the co-pilot stays up front most of the time and chats with the driver. He also brings the driver tea and food. And, he walks through the bus offering food and drinks for sale to the passengers. This is why they do not want you bringing on your own food and drinks! After about 90 minutes, I was getting to the point where I could really use a toilet break. Of course, there was no toilet on board, so I was kind of squirming in my seat. Then, much to my relief, the driver pulled over into a pull-off area. Imagine my surprise upon noticing that this was just a pull-off area and that there we no facilities of any kind. Even more surprising was seeing that this little break was so that the driver could have a smoke!! 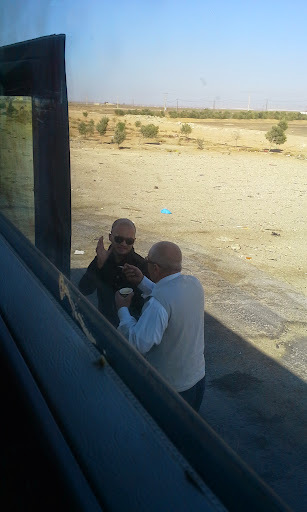 As you might have already guessed, this was the only stop that the bus made before getting to Amman. Upon arrival, you can use the facilities inside the JETT bus office. Just remember to bring your own toilet paper. And when I was there, the lock on the door to the women’s toilet was not functioning. The ride itself was fine. I get car sick very easily, but found that I was okay on this ride. But, if I had it to do all over again, then I would not have taken the JETT bus and would have paid for a driver instead. In fact, the only good thing that I can say about this method of transportation is that at least it did not cost much. Ever Heard Of The Sport Pickleball? It’s Not Just For Old People! I’m off to jordan in a couple of weeks and was interested to see your post on getting a jett bus from aqaba to amman. You mention several a day. On their website they dont list any. Did you find that there were a lot more jett buses once you got there? Also did you try local buses? I didn’t get the bus schedule until I got to Aqaba and went to the bus office to check times. Not sure if it has changed but at the time their website hadn’t been updated in a while. Jett was the only bus service I used while I was there as I paid for a driver to get from Madaba to Petra and I used a taxi to get between Amman and the Dead Sea. Have fun and best of luck! The bus stop in Amman is at the 7th Circle, so if you search for the bus from Aqaba to Amman on the schedule of the JETT web site, look for “Aqaba – 7th Circle” (and vice versa). Additionally, there is a VIP bus twice a day which might be a bit roomier. Thanks for the update, Bernd! Hi, did you manage to take the bus to Amman? Anything to share from your experience? We’re about to do the same in a week’s time.. and the above post scares me a bit. Yeah, the experience of taking the bus to Amman from Aqaba is what I wrote about in the post above. It wasn’t ideal and if I could do it over, we’d just pay for a driver instead of taking the bus to be more comfortable. Otherwise, carefully sneak on your drink/snack and make sure you pee before you get on the bus cause it was a long ride with no stops for peeing or eating.